Disclaimer: Let me begin by saying that I am not an expert. I am only speaking from my perspective and these are just my opinions. It is not my intention to make any Mommy feel like they are not doing enough or providing the best for their baby. With that said lets get this food party started!!!!!!! So when it was time to start giving Aiden food, of COURSE I was going to be making all of his baby food. While I was pregnant we converted to organic food so Aiden got the good stuff right from the beginning. Also while pregnant I fell in love with the Beaba Babycook at William-Sonoma. It is a WONDERFUL machine and I just had to have it when it was time for me to make my baby food. And I made it so well known that I wanted it that I got TWO of them for Christmas!!!! (Thanks Mommy and Paul) Needless to say I tried to justify having two, but ended taking one back and ordering Aiden's FAB Radian 65 Convertible car seat...but car seats will come in another post. The Beaba will run about $149 which can be a little expensive (it is worth every penny though) so an alternative is a mini food processors that you can get almost anywhere for under $20. Just use a steamer basket in a pot to steam the food in. This thing steams, purees, AND reheats (defrosts) ALL IN ONE!!!! You can't beat that with a stick. It is so quick and easy....and super easy to clean. It makes my puree-a-thons go in a snap. I know what you are thinking...how time consuming it must be to make baby food. Well it is not!!!! What I did was ordered my 2oz Jumbo baby Cubes (that are BPA free) from my favorite online baby store One Step Head for me to freeze the food in. At first I just got two sets (each set has 8-2oz containers) but I later found it better to have 4 sets total so I ordered more...and at $5.95 each it was a STEAL. Went to the Dekalb County Farmer's Market here in Atlanta (I could do a post on this place alone because it is that fabulous!!!) where for like $26 I could get Aiden 2 kinds of apples, 2 kinds of squash, zucchini, avocado, pears, mango, carrots, berries, and sweet potatoes (enough to freeze for about 2-3weeks worth of food)...and ALL ORGANIC at that!!!! And spend a Sunday afternoon having a puree-a-thon. Maybe I make it sound so easy because it is. I just put Aiden in his Excersaucer or let me crawl around on the floor. Pop the sweet potatoes, acorn squash, and McIntosh apples in the oven. Steam the Fugi apples in the babycook and then play with him for like 25 minutes while they steam...puree them, put them in the containers, pop them in the freezer and move on to the next item to puree. It really is that easy!!!! So lets talk food. Organic is best...bottom line. 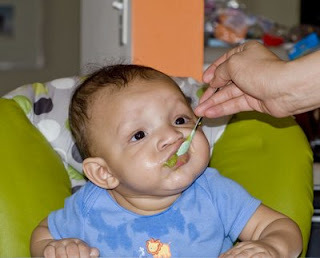 Whether you are doing fresh or jar you MUST MUST MUST feed your baby organic. You want to always avoid added sugar...only foods and juices that are naturally sweetened. Find a local farmers market or co-op in your area...try to avoid Whole Foods because they are WAY overpriced. That way you know that you are getting fresh and it will clearly let you know what items are organic and what are not. Jar Vs Fresh. There are a few things that make fresh better other than it being just that...fresh. Jarred baby food is VERY bland. The food that you make is so much yummyer because it is...well for lack of a better word...fresh. You can add a little butter (and I mean the real stuff people...not country crock that is 55% vegetable oil) or some herbs or spices to the food to give it that extra kick. You will not find that in jarred food. Don't get me wrong...when we have traveled to Minnesota I have bought Aiden some Earth's Best baby food. He does not like it very much but he will eat it. (The babycook is small enough to travel with, but by car...lol. I would not trust any airline not to break my $149 babycook...and I would be too mad about it if they did!!!) I tried out a couple kinds at home before going out of town so I knew which ones Aiden liked. Made it easier for me when I got to Minnesota. Another brand that is good is Happy Baby...and the cool thing about this kind is that it is not jarred!!!! You buy it frozen as if you made it!!!! How about them apples!!! Aiden eats their puffs and LOVES THEM...they come in apple, banana, and greens. They have a location on their site where you can find where to buy their product in your area or they can ship it to you...how fab is that!!!! What I suggest is just to try making fresh baby food a couple times. Invest a little money in the future of your baby's taste buds. What you give your baby now is going to be what they eat in the future. I am so glad that my parents introduced ALL kinds of foods to me as a child because there is not ONE veggie that I do not eat today...I even like brussel sprouts!!!! And it is what is best for their bodies. There are tons of sites out there with recipes and how to instructions. I have the Cooking For Baby book and I refer to the Wholesome Babyfood site all the time. If you have any questions about when to give your baby certain foods or recipe questions...shoot me an email at allthingbaby@gmail.com. I will do my best to either answer your question or show you where you can find the answer. As all my friends that are Mommy's or will be Mommy's know...I am a researchaholic when it comes to ALL THINGS BABY!!!! So you know you have to keep this blog up until.....i have babies....which could be a while.....so... good luck! I will keep it up as long as I have a child...because the adventure never ends...lmao. And I will keep up to date with the latest products and etc for the future Mommy's.